In a small saucepan, bring vegetable stock, heavy cream, thyme, and rosemary to a boil. Remove the herbs from the stock and season with salt and pepper. Stir the polenta into the hot stock and cook for approx. 10 - 15 min. on low heat, stirring occasionally. Meanwhile, clean and quarter mushrooms. Finely slice onion. Fry onion and mushrooms in some vegetable oil. Sprinkle with a pinch of sugar and deglaze pan with balsamic vinegar. Season with salt and pepper. Allow to reduce for approx. 1 - 2 min. 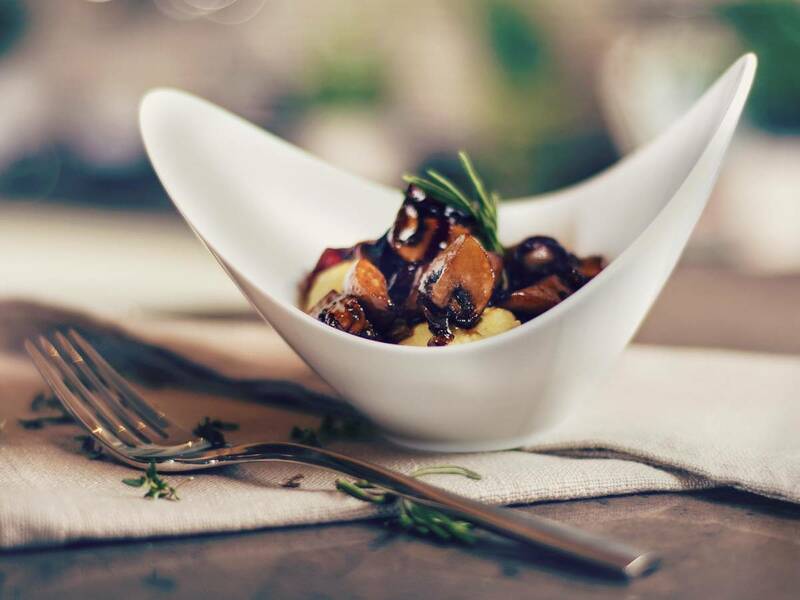 Top the polenta with the balsamic mushrooms and sauce.